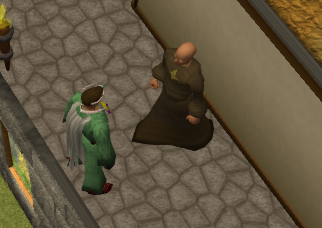 Welcome to the Prayer Guild, home to Saradomin Monks. You will find many interesting attractions, from the ground floor of the Monastery to the Guild upstairs. Rubbing a charged Amulet of Glory. Using a Skull Sceptre, available to get at the Stronghold of Security, and teleporting to Barbarian Village. Then head north. After getting to Edgeville, head north up to the Wilderness, then go southwest and you'll arrive at the northern entrance of the Monastery. Another path to the Monastery can be from Barbarian Village. You can get there using a Skull Sceptre. Go through the fence to the east and you should see a forest in the north. Walk through it and soon you should arrive at the southern entrance of the Monastery. To get there directly, simply rub a Combat Bracelet and choose to teleport to the Monastery. The ground floor of the Monastery has a few interesting attractions, and is the entrance to the Prayer Guild above. Although it isn't really a part of the Prayer Guild, it's still an important part of the Monastery where the Prayer Guild resides. At the northernmost section of the Monastery is a group of Sheep and Level-2 Rams, marking the beginning of the Wilderness. With a pair of Shears, you can Shear the Sheep to acquire Wool, which can be used to make Balls of Wool. 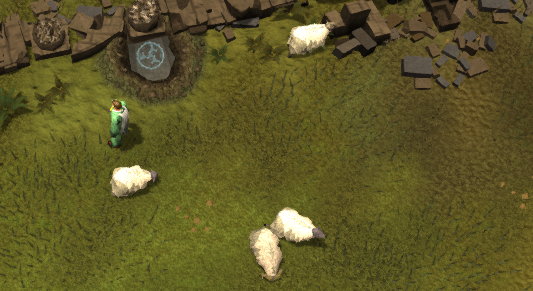 Balls of Wool can be crafted into Amulet Strings, or they can be traded with Ned in Draynor Village for Rope. In the Rag and Bone Man quest, they can drop Ram Skulls. A bit south is a patch of 12 Cabbages, which you can pick and eat, to heal 10 Life Points. They are also commonly used in the Black Knights' Fortress quest, as it is very near the fortress. Surrounding the Cabbages are some red, pink, and white rose bushes, which play a role in Garden of Tranquillity. Continuing south, you will find the courtyard, containing four Fountains and a few Level-5 Monks. You can fill your Bowls, Buckets, Jugs, Vials, and such by using them with a Fountain. The Monks are very popular to fight because they hit low and can heal themselves, causing the fight to last longer. Therefore, you will get more experience points. If you talk to one, you can ask him to heal your Life Points. They can heal up to 150. There are two buildings to the east and west. The ladders inside lead to the Prayer Guild. In the building to the east is Abbot Langley. You can ask him to heal you as well. He can heal up to 120 Life Points. If you have over 31 Prayer, you can go up the ladder in either of the corridors to enter the Prayer Guild, with a few interesting attractions. One of the first thing you will see is the Kharid Scorpion. It plays a role in Scorpion Catcher. 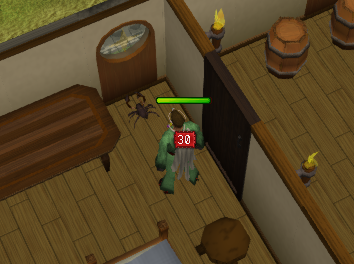 If you aren't using the cage from the quest and try to pick it up, it will sting you and deal thirty damage. 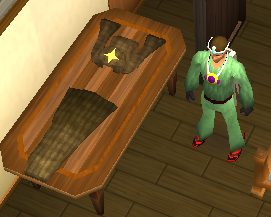 Go through the door to the east and on the table you'll find a table with a Monk's Robe top and bottom respawn. The top has a +6 Prayer bonus and the bottom has a +5 Prayer bonus. Go through the north door again and you'll see a Level-5 Monk. Go through the west door of that room and you'll enter a room with a special altar. 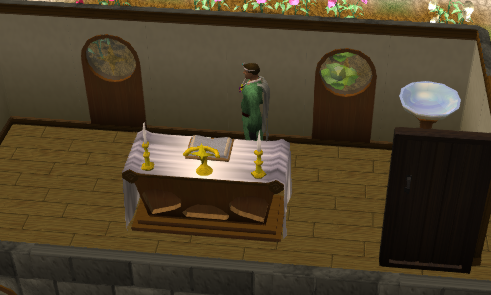 It is the only altar in RuneScape, apart from the one you can use after completing Nature Spirit, in which praying at it will heal your Prayer Points and it'll add an extra two, but it doesn't raise your Prayer level, unfortunately. 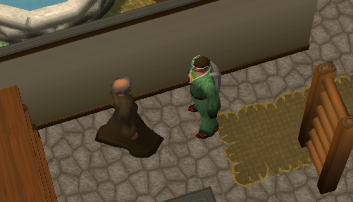 For example, if somebody with 41 Prayer prays at the altar, they'll get 43/41 Prayer points. It doesn't mean that they can use the prayer, Protect from Melee, though. 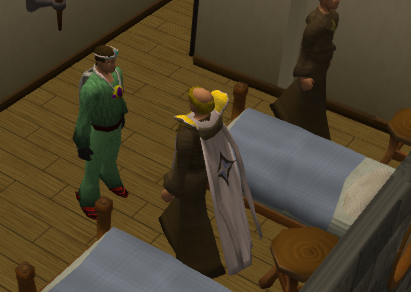 In the room just north of the western ladder, you'll see another Level 5 Monk and Brother Jered. He can sell you a Prayer Cape of Achievement for 99,000 coins if you have a Prayer level of 99. He will also bless any Unblessed Symbols that you have, to turn them into a Holy Symbol . You can make Unblessed Symbols by smelting a Silver Bar in a furnace with a Holy Symbol Mould. Then use a Ball of Wool with it. If you wear it, it will give you a +8 Prayer bonus.